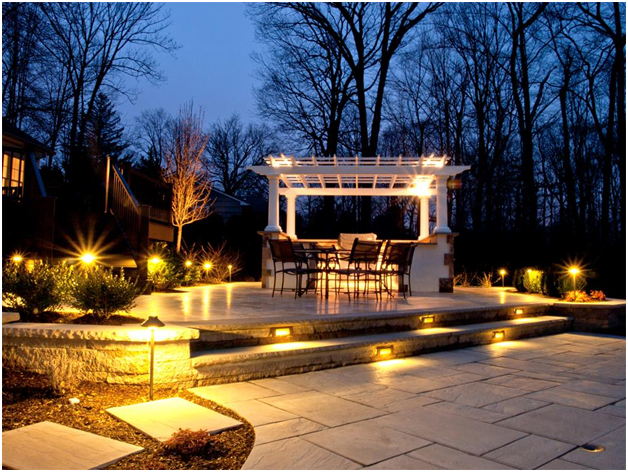 We are specialists when it comes to designing lighting for your landscape. First, you need to plan on how you intend to use the space. Maybe the kids want to play sports in the yard after dark; maybe you entertain guests and need to have illuminated walkways; or maybe you just want a nice view when you get home from work each evening. Also when designing your outdoor lighting, you should keep a few things in mind. First, since you spend most of your time indoors, you want to have nice focal points that can be seen from inside. Next, you need to have one or two focal points. Pick trees or structures that you want to highlight in your landscape. Additionally, you should plan on what structures to light. Lighting pathways is important for both beauty and safety. We spend a lot of time with family and friends on our patios so you should consider lighting these areas, perhaps with moonlighting to keep from blinding people. Trees are perfect for up-lighting and crosslighting to add a shadow effect to surrounding structures. 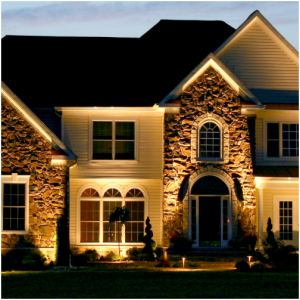 Architectural elements and hardscapes are ideal for spotlighting to highlight specific features. Lastly, you may consider lighting your driveway, which just needs a little light since you will use your headlights to see. There are many things to keep in mind when designing lighting and we can assist you in the process. A well-conceived lighting control system is an important element of a home theater strictly from a performance standpoint, the light sources must be conformed so that they don’t cast any glare on the screen, which would wash out the picture. Lighting controls must also allow for an aesthetic quality that sets the right mood and that makes the room inviting and comfortable. Most importantly, they need to satisfactorily illuminate the room to allow people to safely move about. If a home theater happens to be located in a multi-purpose room, other lighting factors come into play such as making allowances for entertainment purposes, reading, or playing games. In addition to home theater lighting, Dantech and Out of Sight Home Theater offers homeowners whole house residential lighting control systems that offer added convenience, energy conservation, and security benefits. Dimmers and switches can be connected to master controls that turn lights on and off throughout the house and garden, as well as monitor lights for energy saving purposes. Landscape lights can even be automatically synched to the astronomical time clock. “ALL-ON” buttons can be activated in case of emergencies that instantly illuminate all home lights and security systems. Lighting controls can also be designed to consolidate or eliminate traditional switches by replacing them with a single keypad or touch screen for a clean attractive appearance. Moving up the technology ladder, a homeowner can also choose lighting controls that dim lights or switch lights on and off based on input from sensors to detect motion or infrared radiation from a person. There are also photo sensors that adjust light levels based on the amount of available daylight, and sensors that are suitable for accessibility purposes that operate lighting by voice or sound. Many lighting control systems also include the option of remote control via phone or computer. Homeowners are offered virtually unlimited options in programming a customized lighting control scheme. Some popular solutions include turning on the hallway lights from a bedroom to check on a baby at night or to create a lighted path to the refrigerator for a late night snack. Another popular program is automatically lighting a way through the house that is actuated by the garage door being opened. Customized lighting control solutions are also used to create mood and ambiance, whereby a dining room dimly lit for a romantic dinner one night can be transformed into a brightly lit space for a family party the next night. They also enhance the design of a room through the use of plant lights, spotlights for artwork, cove lighting, and wall sconces. Some residential lighting control systems are “plug and play,” while other systems require initial programming by the installer. Basically, all whole house lighting control systems require some user interface, although programming is essentially a simple procedure. Contact a member of our sales team for more information. Dantech, Inc. is an exclusive custom Lighting Technologies dealer in the Baltimore Metropolitan area, offering energy efficient products that have been proven to increase efficiency and energy cost savings. Our knowledgable team will perform a thorough energy audit to determine the individual needs of each business, thus allowing us to tailor each commercial lighting design. After determining the ideal amount of light required by each building, we select fixtures that complement the style of your business. Our diverse portfolio includes LED lighting design for restaurants, offices, schools, shopping malls, warehouses and more, proving we offer a solution for everyone and in every market. Dan Uddeme is a Lighting Design Consultant who specializes in offering Residential lighting solutions. We are happy to provide solutions to any size project from small refurbishments and extensions right through to complete full refurbishments and new builds. With over 20 years experience in the Residential, Commercial, Industrial and exterior lighting sector, we are perfectly placed to offer a full range of services from advice through to full 2D and 3D designs, plan drawings, schedules and circuit diagrams. To complete our services, we are also able to offer lighting products from a whole host of manufacturers which are not always available on the general market. This gives a greater scope of products to offer fulfilling both aesthetic and technical qualities.